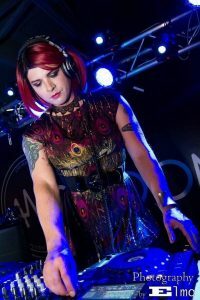 With almost two decades of experience behind the decks, DJ Heather Feather is a techno performance artist, transforming herself into a musical enigma, bending minds and melting faces with her sick beats. She has graced the booth in the local EDM scene for years, playing popular clubs like The Falls, Web House, Amp Room, The Garden, and Wax Club, just to name a few. DJ Heather Feather is one of the hottest tickets in town – she’s sure to bring a party everywhere she goes.